Still not sure but one thing has happened this year we have missed spring out here in the Florida Keys. It only seems days ago we were going out with as many layers on as we could and the water was way hotter than the air and each day the sea temps were falling. Now it is the oppersite near record highs ever day and with no wind the sea is getting to summer levels of heat the fish I think have been a bit confused. 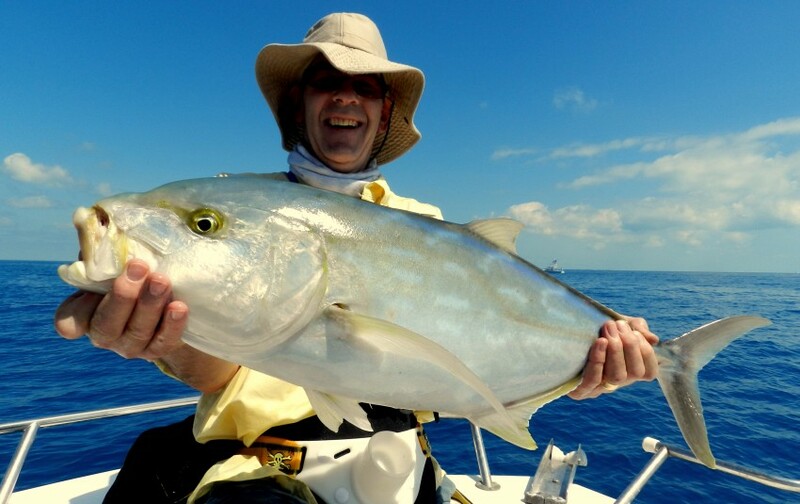 What a lot of people dont know days of flat calm as we have had this week do not help fishing in the tropics we end up with a layer of stale water on the top as you need waves to put air into the water and keep the fish happy. Its not so bad offshore but in the shallows of the bay it can be a problem but the joy of the Florida Keys we always find fish some days it takes a little longer. Its great this week to have back yet again my Bromley Boys on their 11 th trip not sure how or why but as a group of friends it just works. 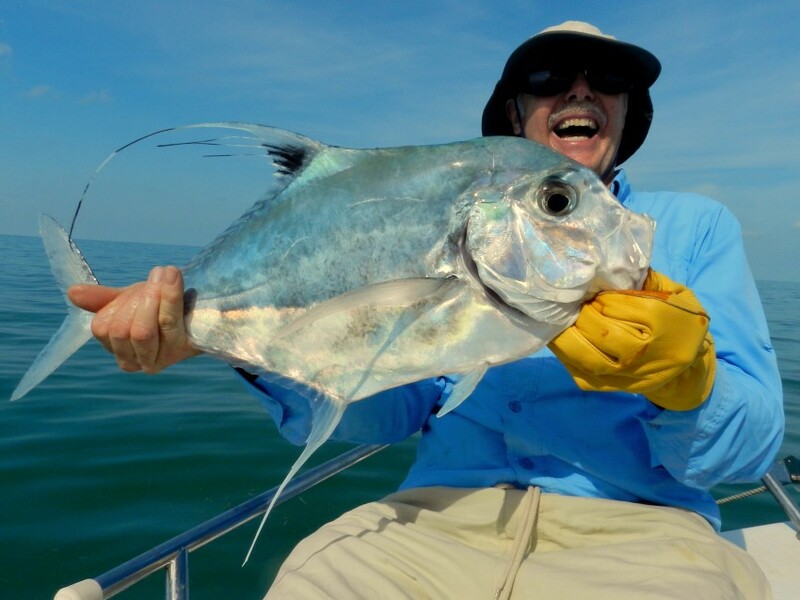 As normal fun ever day have a look at the videos John was having way to much fun with the fly rod and yes had to go to a non standard fly but some people just love fly rods and as you I hope know on our Fishing Holidays in the Florida Keys what you want goes. 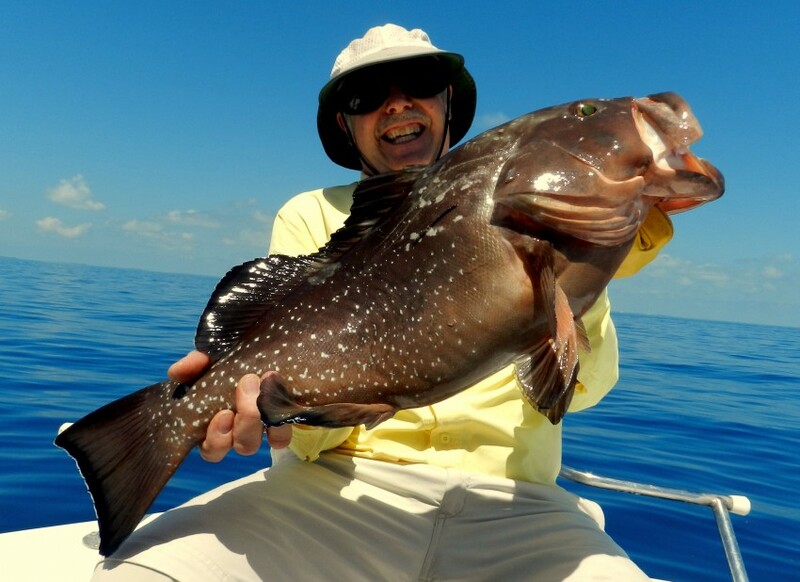 Seems way to long now since I have tasted the creamy white flakes of grouper still over a month to go but most weeks we put back keepers do I see a difference after the bans not sure but one thing the boffins know best and in Florida the fish come first. Well the one thing the warming has help the tarpon run has started and yes we have had our first fish of 2015 and an other permit day on a bay wreck all on the next blog. Comments Off on Global warming ? What a week the weather gods being far from kind the first day a whole new meaning to glass seas in fact one of the guys said he had never seen a sea so flat maybe that was the kiss of death since the first day just chasing the few calm spots. 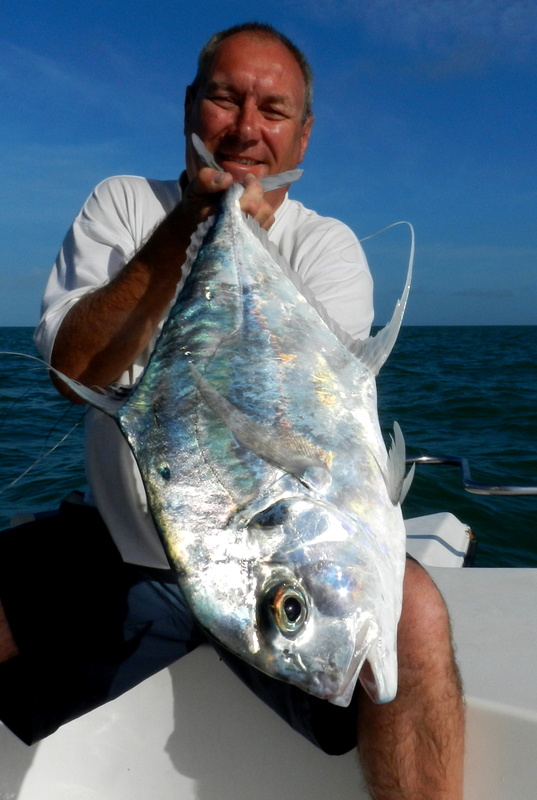 Not sure why but fishing in strange spots this week has given some amazing fishing with fish over 100 lbs every day and in fact 7 days we had fish near 300 lbs every day just the Florida Keys. Taking shelter the other day just yards from the shore having great fun with the sporty shark Ian lets us all know ” this is no sporty ” so on just a 30 lb mono rods off we go to chase it down. After god knows hoe long we have a near 300 lb hammerhead at the boat on such light tackle just an amazing job well done the boy. 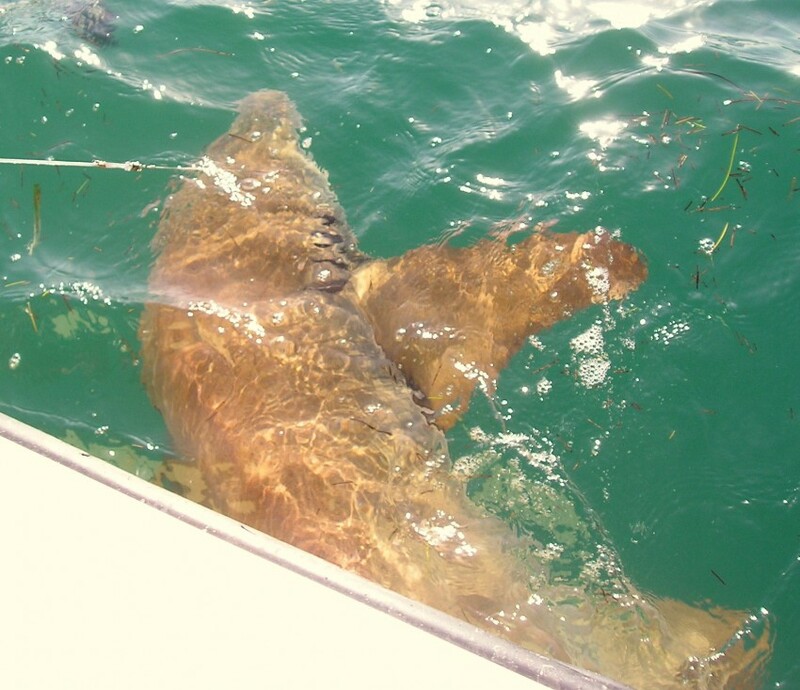 The other day in a raging wind we had to go north over 12 miles to a small rocky channel having some fun with smaller stuff when the shark rod went off but this was no shark soon we were fighting a big goliath grouper. 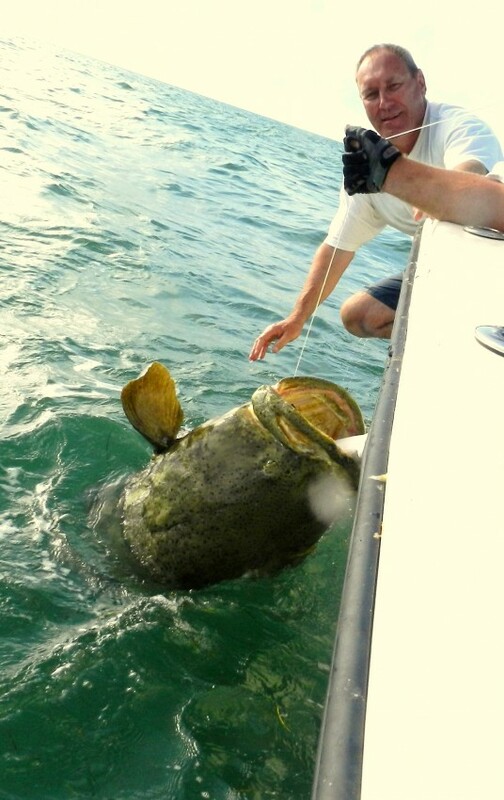 The rod was not our big boy and soon the fish had got back to its hole but with patience and the old tricks we had it way over 300 lbs and jet an other grouper spot in the GPS. 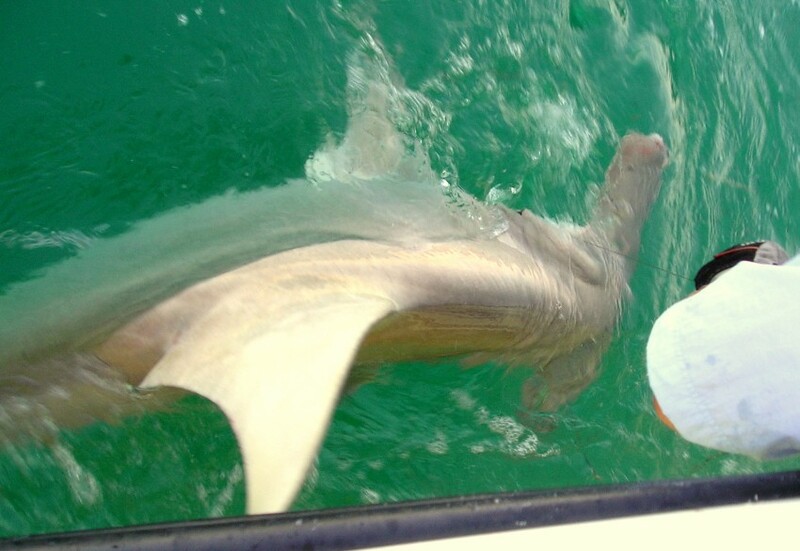 Best of all this week and maybe a very close second to John’s bull was yet an other hammerhead to Dereck while taking shelter behind a bank having fun with the new arrivals the cero mackerel. It took some time dropping the bait many times bur by changing the bait to smaller one at last the hook stuck but I am sure the sight of that fish in just 8 ft water rolling on you bait will live for ever. 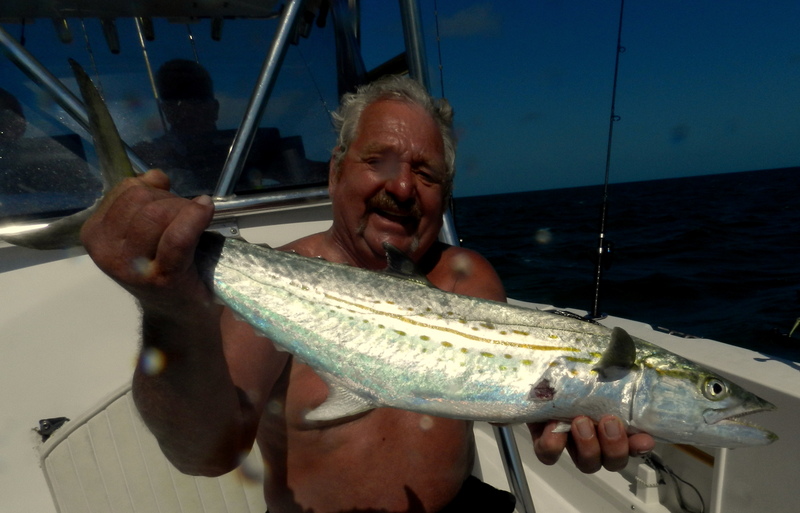 Last morning which as always comes way to fast fun on a bay wreck at last and one of our monster grouper for John and we had a very strange blacktip shark that took a smaller spinner on a 20 lb braid rod only just threw the pick in time as Dereck was about to be spooled. 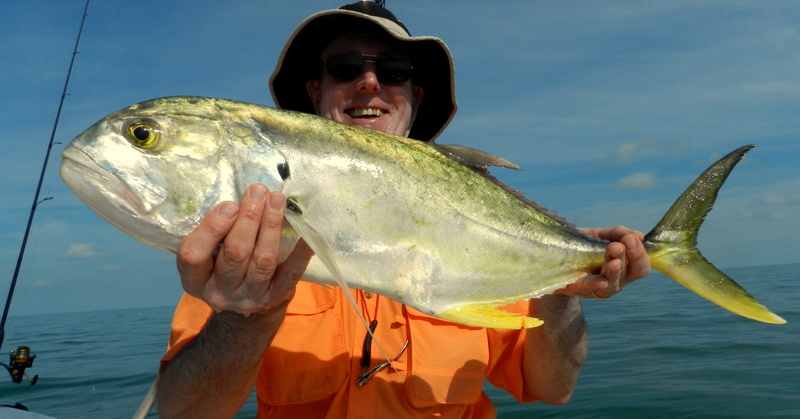 So yet again an other fantastic week’s fishing and way to much laughter for an old guy thanks boys. Firstly I must say what a blast it is to have my local boys ( from Berwick ) back again John, Ian and Dereck at least once a day their banter leads me to floods of tears and laughter they say laughing keeps you young so after their trip I will be a teenager again. 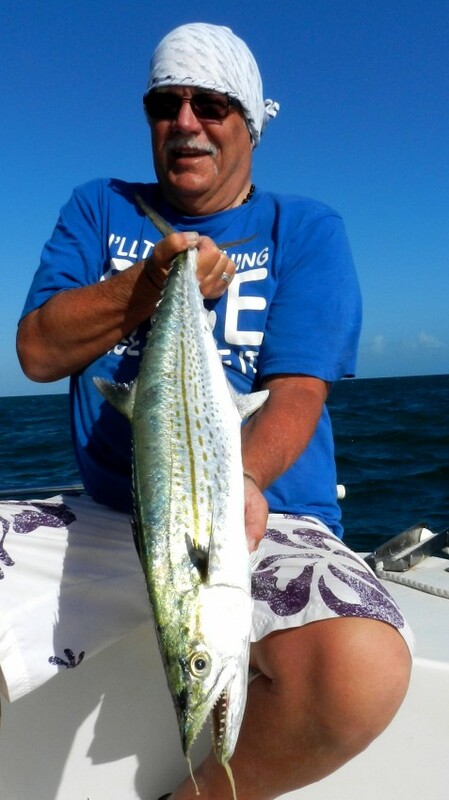 After doing Fishing Holidays in the Florida Keys now for so long I seem to have been accepted as a local and the other day it paid off. 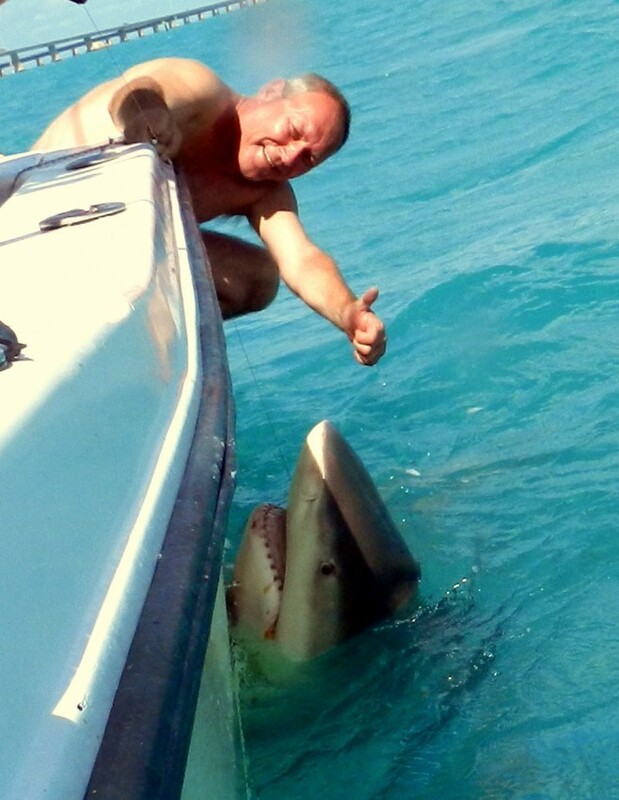 The weather gods have not been to bad but not perfect and we were taking shelter behind a bank when a local guide took time out to come over and tell the crazy Brits where he had just been trashed by not on but 5 bull sharks. 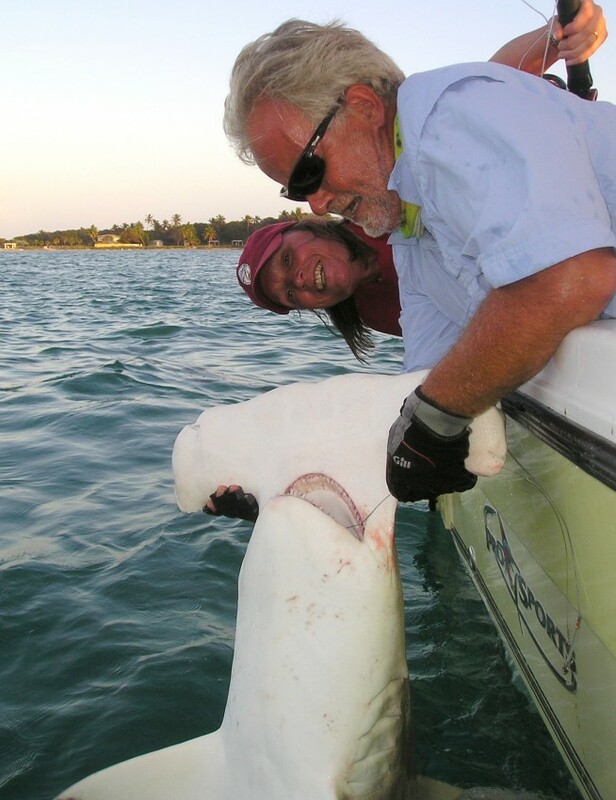 Now the locals hate sharks but they have got to know I and my guests love them so the real time info was very good news so off we went. 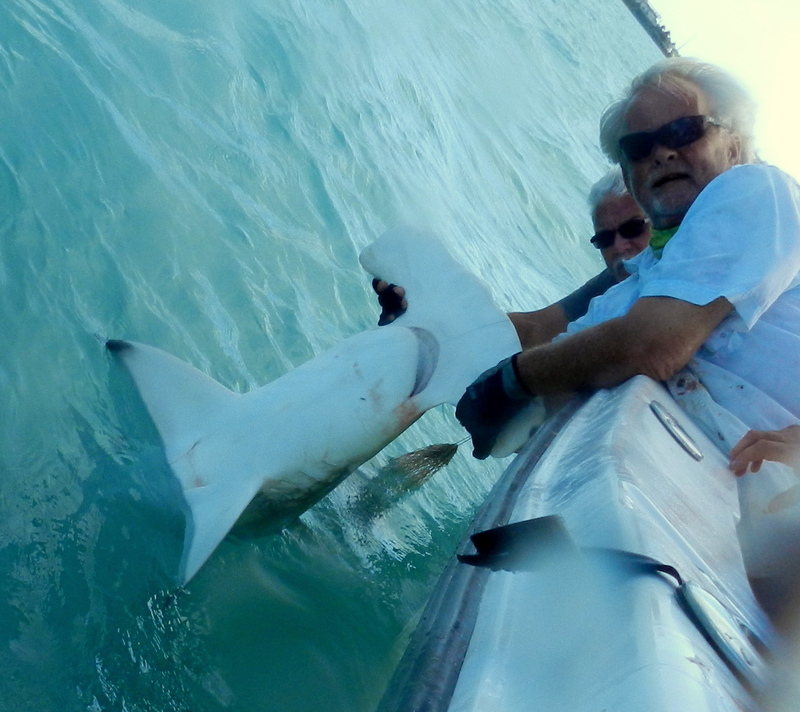 So started the maddest three days shark fishing I have ever had in the Florida Keys. 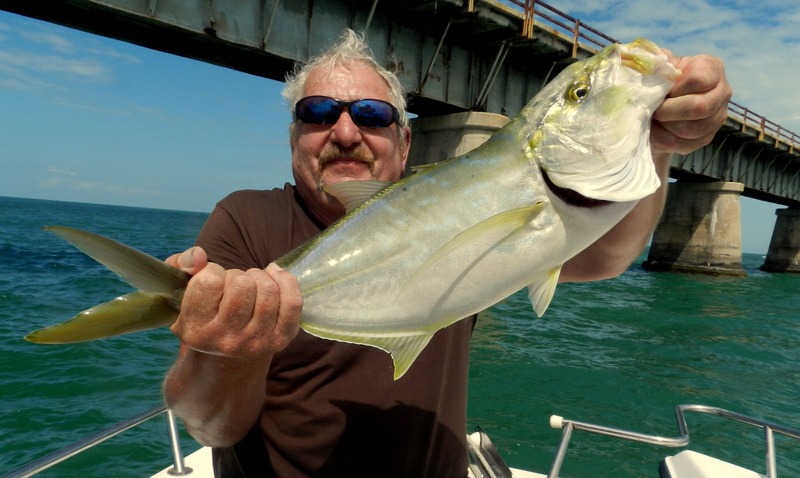 On arriving the first bait down had only gone back about 20 yds to the old 7 mile bridge when bang fish on and as we were sitting between the bridges had to throw the pick and chase down just like tarpon. 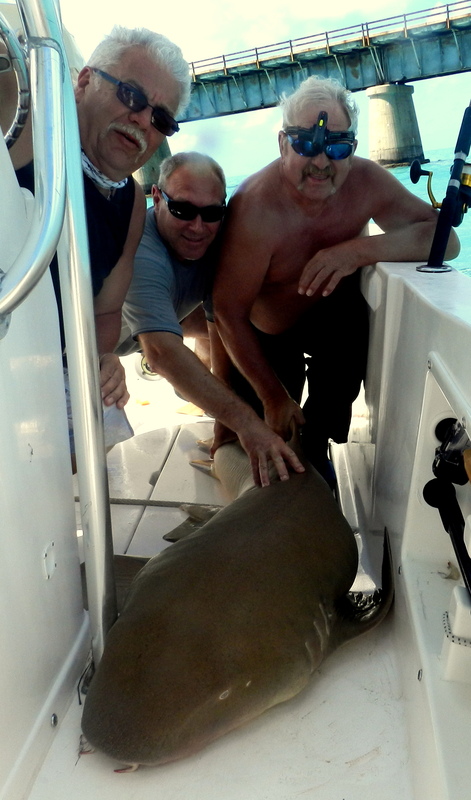 Boy were these big and strong bull shark all three we had to the boat the first day well over 250 lbs and best I would say near 400 lbs yes we lost some and had some nurse sharks but what a day. Next day we started off catching more shark bait fun with jacks then back to the same spot and they were still there even madder than the first day four to the boat and the best after a long fight taking us way out into the Atlantic I would say near 500 lbs again we lost some and had more nurses but as a very tired crew said on the way home the best day ever in the Keys. 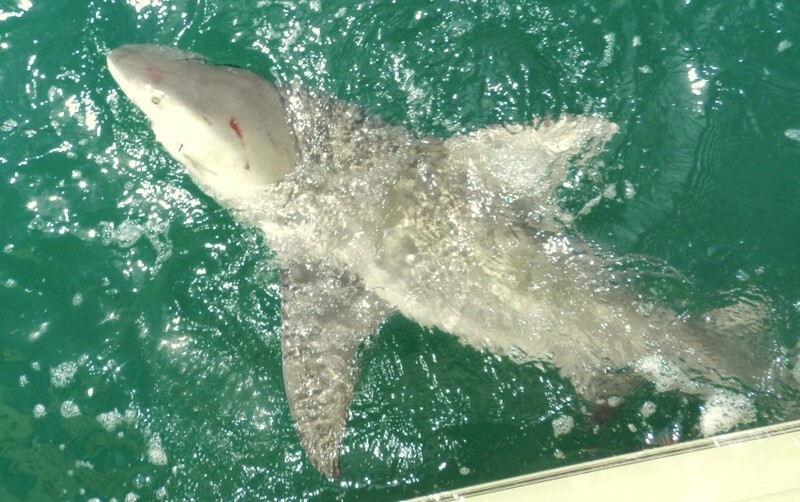 Yesterday we had to get fresh bait and not ideal weather but toughed it out on the mackerel grounds the off to the bull shark yet again these guys just love pain. 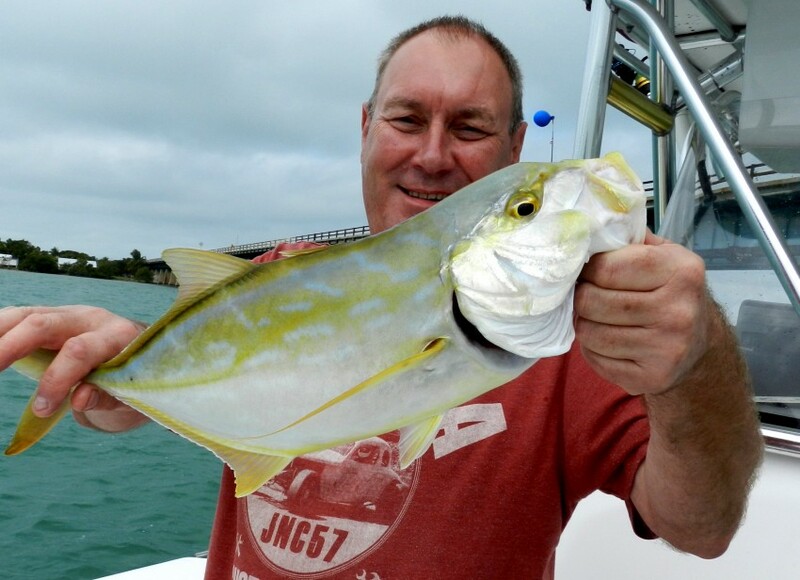 On arriving water not good cloudy and very weedy having to check the baits every ten mins and had a very tame nurse shark which after catching four times had to come aboard to get the hooks out. 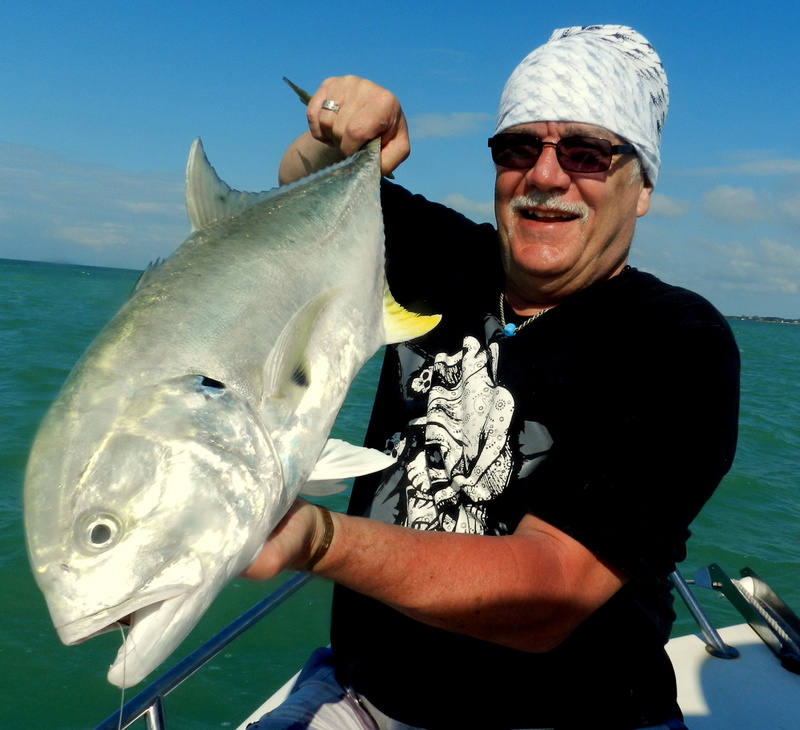 Then something very big took John’s bait swam around the bridge for a short while then took us on a trip to Cuba for the nearly an hour but in very rough seas we had him to the boat and what a fish. 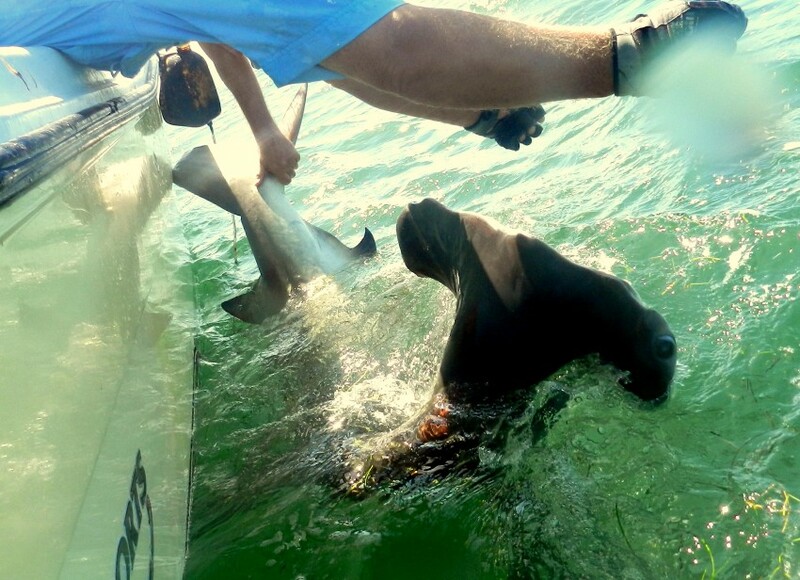 Have a look at the photo and that is me doing my 100 lb dead lift so I even think this fish was way over 500 lbs to sum up well over a ton of bull shark in three days and three very dead fishermen. Just had a late and sad cancellation for a prime tarpon week this year the reason is a massive heath problem and the lead guy can’t make it so the week is up for sale. 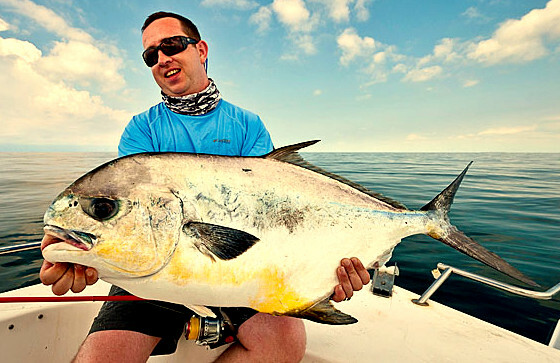 The week is arriving on 27 th April fish 28 th to 5 th May and leave on 6 th May there will be 100 lb + tarpon ever day if you want and it is also the start of the permit spawn on the deep off shore wrecks which can go on all day. 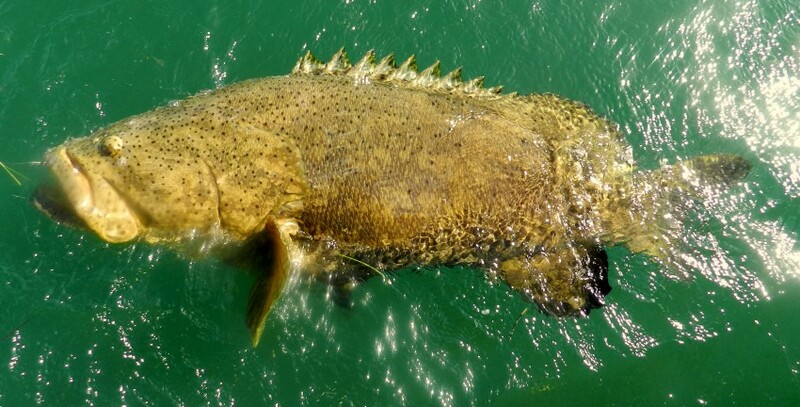 It still blows my mine that the run of the giant tarpon as they also migrate and spawn has been going on for millions of years in fact even before T Rex was stomping around and will still be going on when maybe we have all gone. 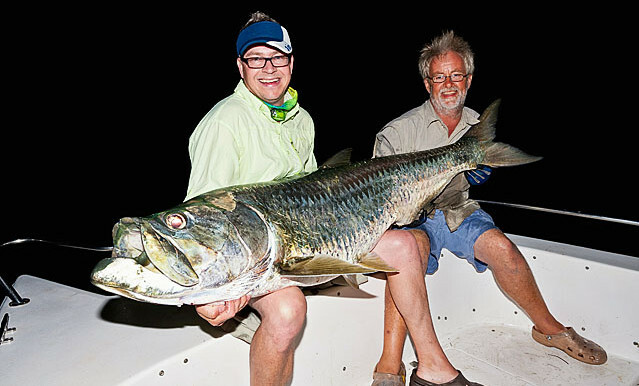 Most of our tarpon are caught in the early morning it has always been my idea if you are going to have a one hour fight it is better getting light than getting dark as is the case with evening fishing. We have been using lighted floats now for years and the sight of your float going under then the first leap of your 6 ft fish right out of the water will live with you for ever. During this week the permit will also take your breath away we catch these on crab jigs on or near the surface and their first line of attack is just to go straight to the bottom at over 100 ft and they will do this many times. 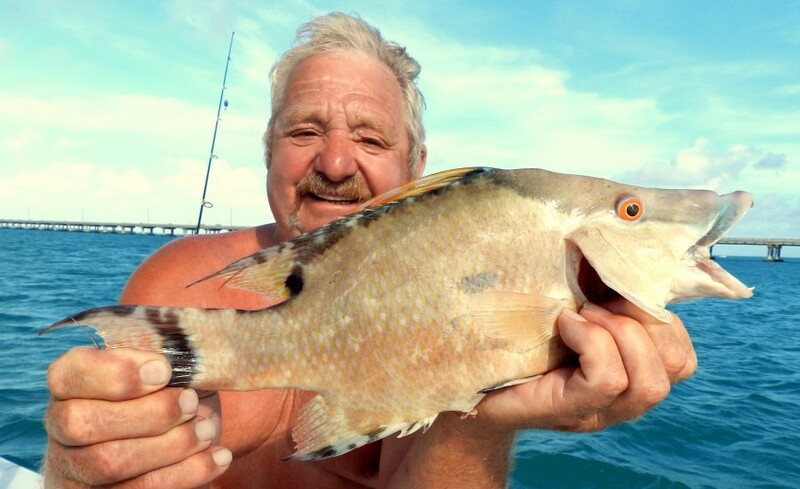 The week is not just about tarpon and permit there should be some good off shore action with dorado, wahoo, tuna, amberjack ect and the bay will have the normal snapper, grouper, cobia and shark and a normal weeks fishing is over 40 species. We have taken some money so there is even a discount on this week. 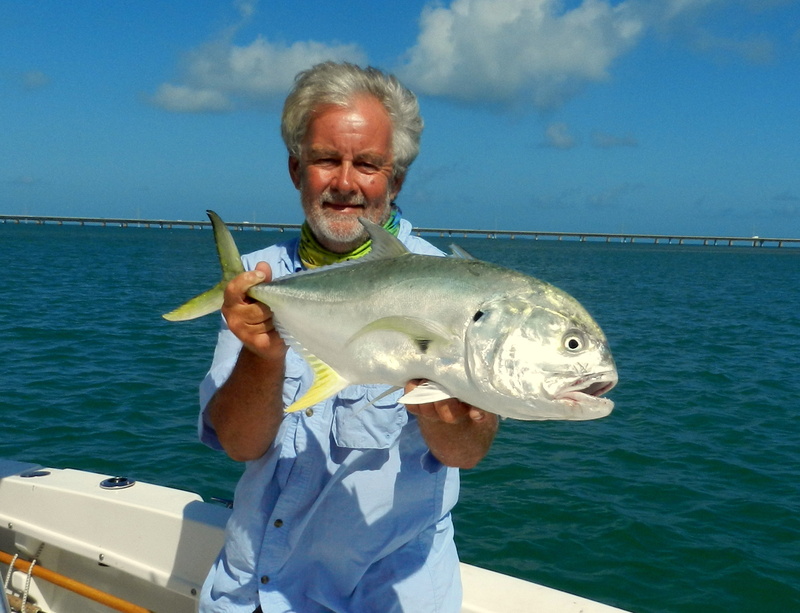 So if a Fishing Holiday in the Florida Keys has been on your bucket list this could be your dream week and as Henry Gilbey has often said it does not come any better than the Florida Keys during tarpon time. 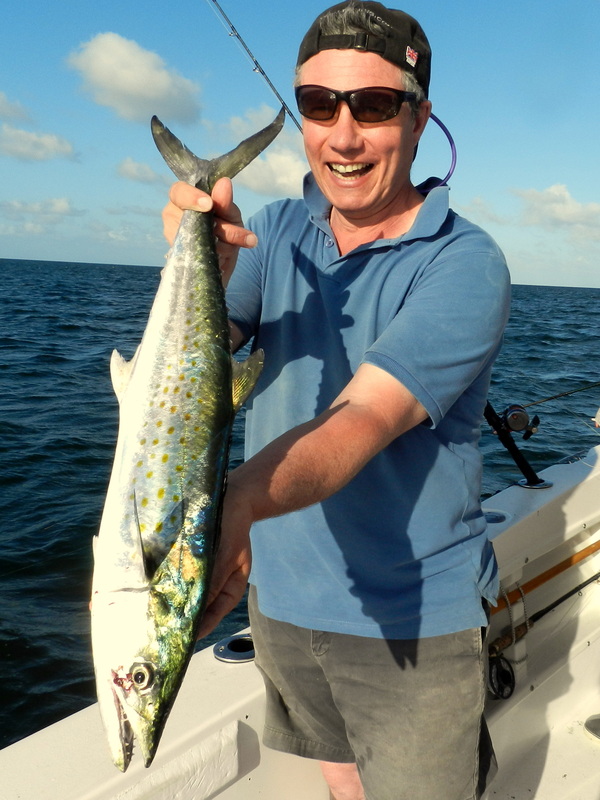 So Mark joins the growing group of guys who decide the best way to celebrate turning 60 is to have a Fishing Holiday in the Florida Keys in fact it was his wife Amanda who did the booking but me thinks Mark did not object at all. The one group I have no control over the weather gods teased us first day 28 miles offshore on tuna then I am afraid they turned and the rest of the week a lot of plan ” B’s ” but we fished all week and had fun all week. Have to say I was well impressed with the Key’s newbies Prue and Jack top marks its a bit like being thrown in at the deep end when you cant swim or have ever been to a swimming pool but they both come away with top marks from skip. 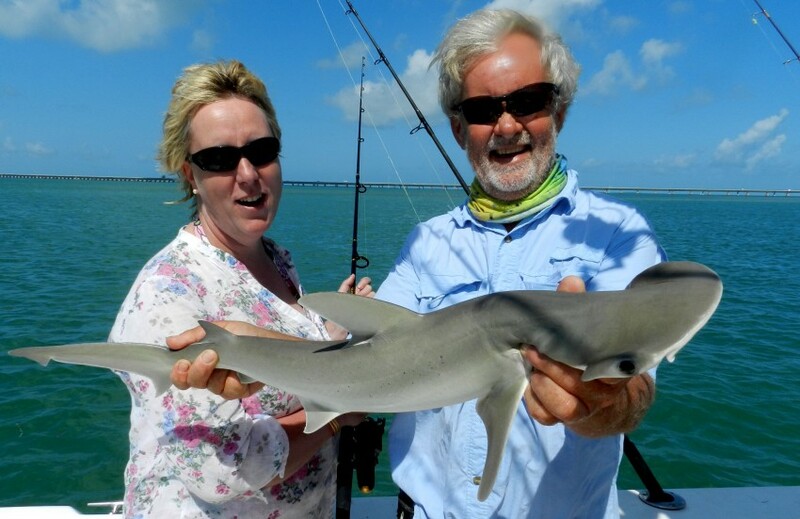 Fish of the week well that has to go to Amanda that hammerhead would have tested many a guy but she got the job done in style. 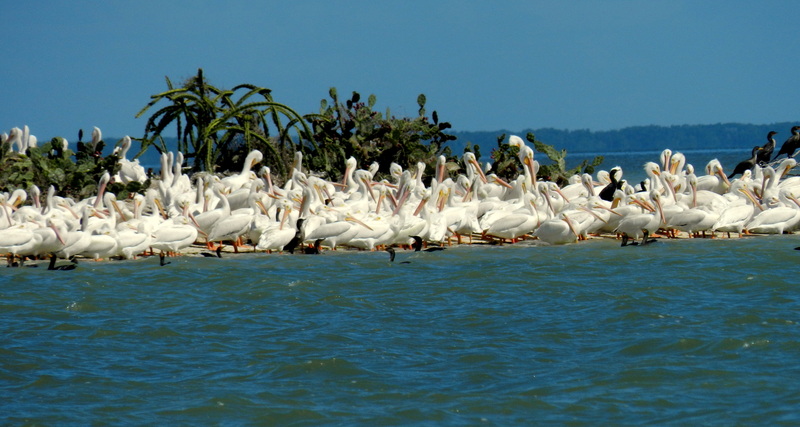 Best way to sum up the week is a load of photos of happy anglers and yes on arty one the only flock of white pelicans in the Keys way up near the everglades looking very cool. 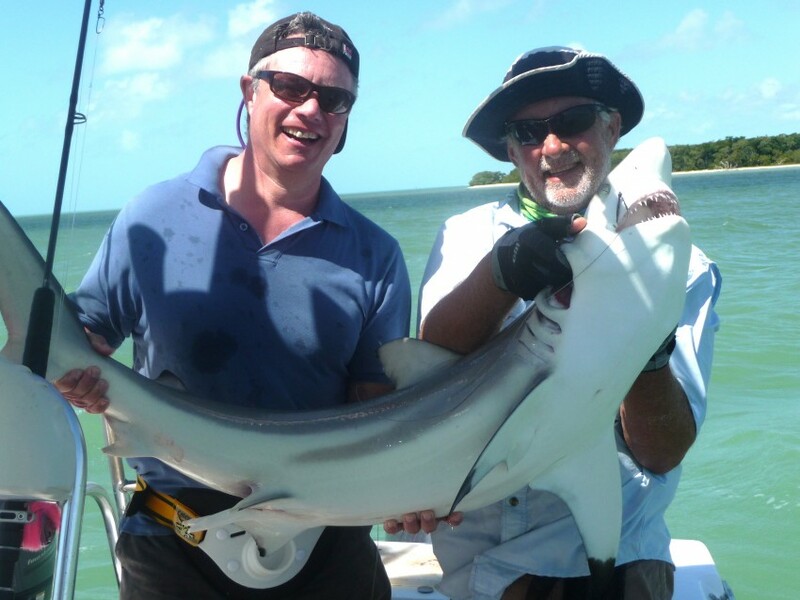 At last some info on Alan and Harry’s tagged shark from the other week. It was tagged on 24 th April 2013 so we had it after 663 days it had only grown 5 cms so it was a fully mature fish and only moved 18 miles during the time so a local fish happy where it lived. Hope it gives the boffins some good info as you all know I love my shark fishing and any help I can give them is good by me. Only downer from last week was showing the guys where to cast and how to speed spin I had a good jack would much liked one of the guys to catch it but it happens. 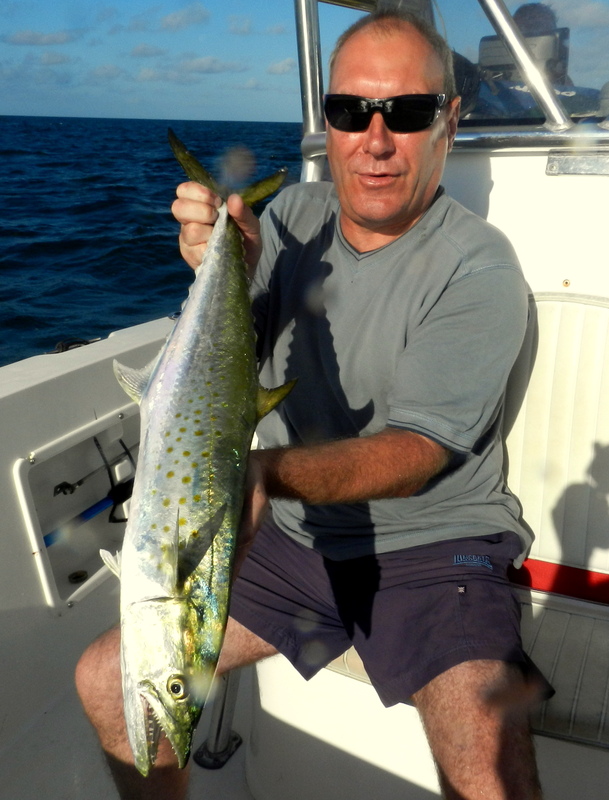 So all in all yet an other fun week in the Florida Keys and here’s hoping to many more years fishing for young ( at heart ) Mark. 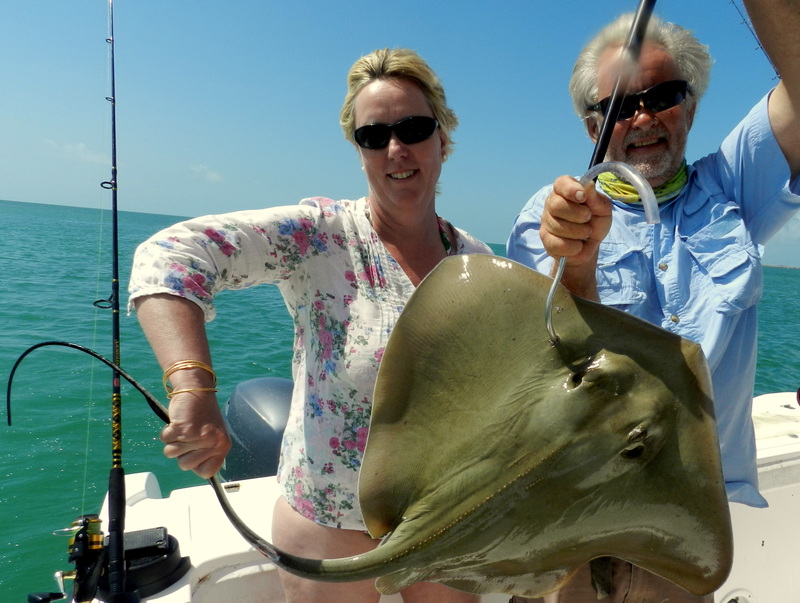 Its great to have my near neighbor and friend Mark Cuddigan and his wife Amanda from Northumberland back on their second Fishing Holiday in the Florida Keys Mark and Amanda live at East Flodden Farm and I live at West Flodden Farm. 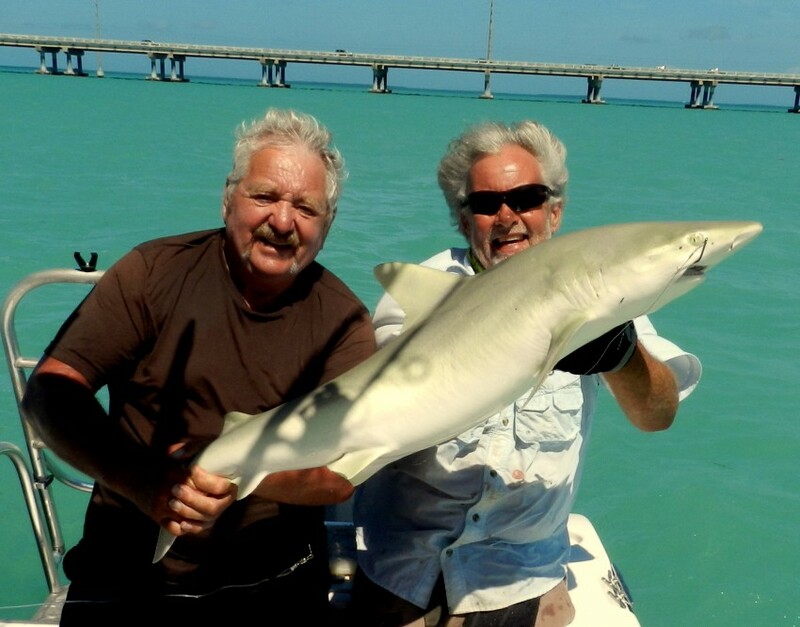 They have brought their friends Pru and James for the full on Florida Keys fishing experience and boy are they throwing them in at the deep end. 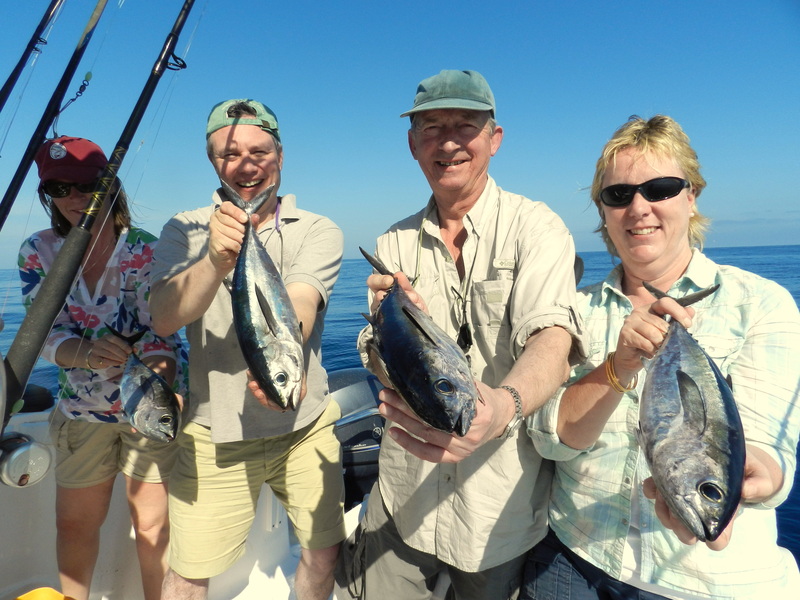 For once the weather gods have been kind very few newbie crews have their first day 28 miles offshore on the tuna grounds there were lots of fish a bit small but as they say they dont half hang on. So with the offshore box ticked the next day it was the shark box to tick which means a fun stop at the mackerel grounds then on to bay wrecks. Had a bit of trouble finding a free one but after nearly 20 experience out here I have lots of plan B’s so we were soon on fish and the girls lead the way with some serious blacktips always fun with their jumps and runs. 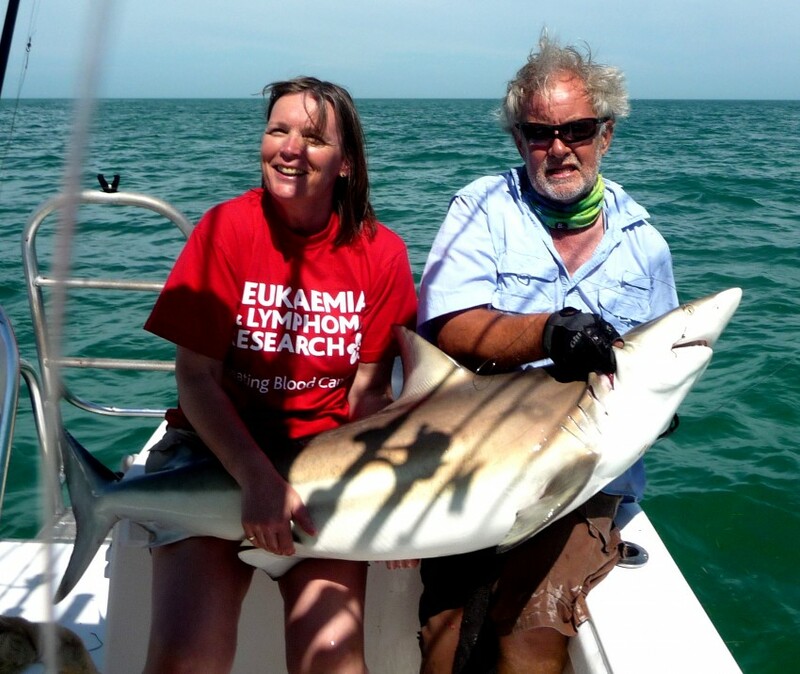 Their last trip Amanda had a very good bull shark at Bahia Honda so float plan for yesterday was load up with fresh mackerel, and have to give the bait fishing to Pru who well and truly trounce the boys then off to see if we could nail a big boy. 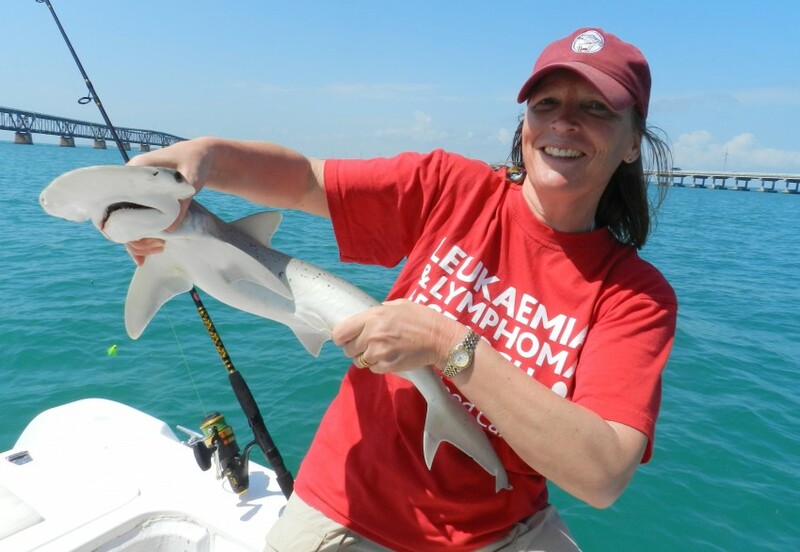 Tide a bit slow on arrival but we had on very frisky nurse shark who at nearly 200 lbs even made us throw the pick and chase through the bridge but fun and a good starter. Nice bit of lunch and ice cream at the cafe so cool to tie the boat outside the cafe then off as the tide started the best north run. An other large nurse and a few missed spinners then the Amanda was into something very big and very unhappy not sure how long but we were following all over the place and I was sure it was one of Bahia Honda’s bulls. 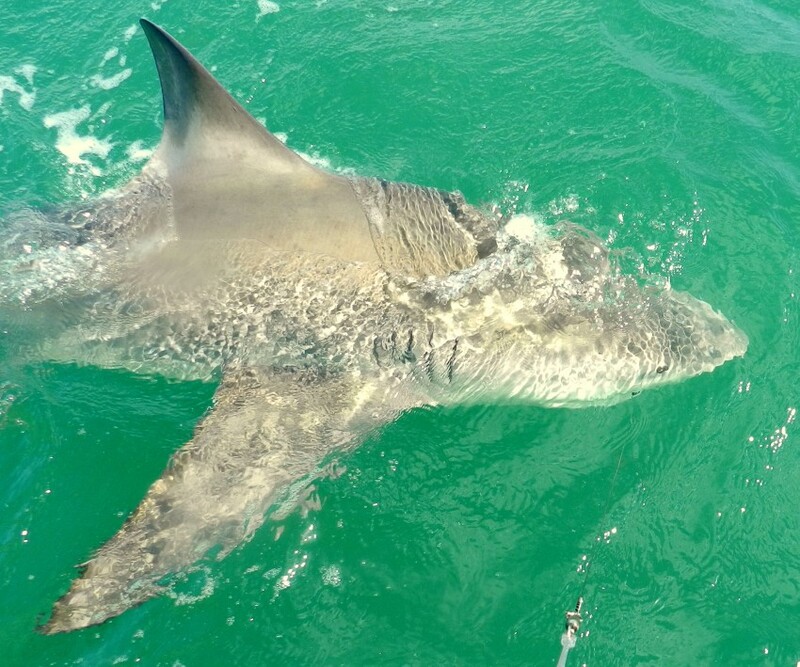 Well skip was very wrong and even I was surprised on the leader pull a stunning hammerhead their is just no stopping this girl who all on her own nailed this near 300 lb shark just what’s the encore.